You can now be burdened when carrying too much stuff. Bug fix: you will now get different dungeons each time you play. Now recenters the player whenever the main window is resized. 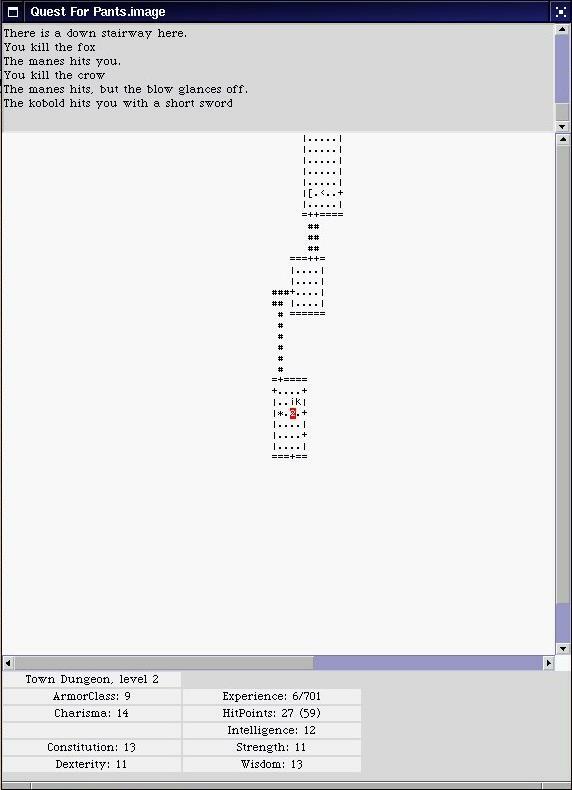 Added 'r' key, which rests until either the player is healed or a monster comes into view. Monsters now leave their inventory behind when they die. Fixed the 'beaded curtain' problem--that is, you can now look into an entire room while standing in the doorway. Made the endgame a bit more interesting. Added lots of extra weapons. Increased the kickassness of the battle spork to give the player a sporting chance. Made charisma, intelligence and wisdom slightly useful. And various other things that might be considered spoilers. Previous versions are available in source-code form. The original version, 1.00, is what I finished at the end of the 7-day period (plus a little bit of hacking to make it work as a standalone application). It's available because that's a condition of the challenge but only as source code so that nobody will actually try to play it. Linux binaries are available here. The file is approximately 3.3Mb in size. Installation instructions are in the file "Install.txt" in the "doc" subdirectory of the archive. You should be able to play the game on non-Linux Unix-like systems simply by replacing the Squeak executable in the archive with one built for your platform. There is now a Windows version. It's kind of ugly and there's no installer, but here it is. MacOSX should be sufficiently Unix-like for the Linux approach to work on it, but I haven't managed to verify this. If you want me to provide an actual OSX distribution, please send me a Mac Mini. Quest For Pants is written in Squeak Smalltalk. If you don't know what that means, go here. 1.00, the original 7-day version. Quest For Pants is released under more-or-less the terms of the GNU General Public License. The "more-or-less" part is a couple of non-GPL open-source files I've included for convenience and an exemption that lets you use Quest For Pants with incompatibly-licensed Smalltalks. See the enclosed file "Copyright.txt" for all of the gory details.